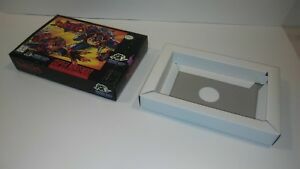 Details about SWAT KATS Super Nintendo RARE BOX (only) SNES Authentic!! SUPER NICE!! SWAT KATS Super Nintendo RARE BOX (only) SNES Authentic!! SUPER NICE!! Shipping is calculated by your location and item weight. We only use USPS Priority Mail shipping to insure safe and expedient delivery for your items. Please do not inquire about other methods of shipment. Buyer must respond within 7 business days of end of auction. Please be aware we do not ship or respond to emails on weekends and therefore ask for your patience if you have purchased an item during the weekend. Thank you very much for your business!